*Plus acquired fund fees of 0.26%. Seeks to achieve an appropriate balance between long-term capital appreciation and capital preservation. 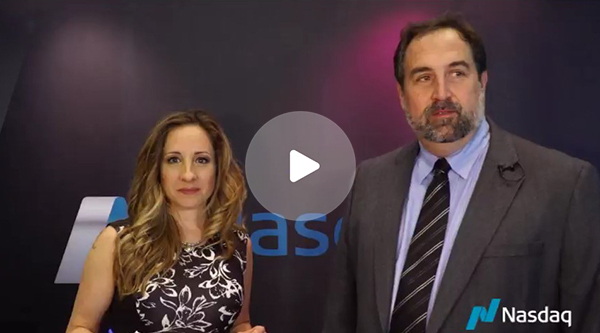 The Fund seeks to achieve its investment objective by implementing a proprietary tactical asset allocation (TAA) model. Based on the technical analysis and relative strength expertise of Dorsey Wright & Associates. 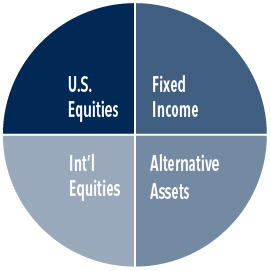 The Dorsey Wright & Associates (DWA) model uses technical analysis to allocate among four market segments: U.S. and International Equities, Fixed Income and Alternative Assets. 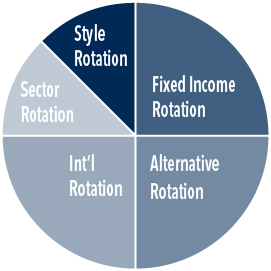 The four market segments are managed through the use of five underlying rotation strategies. The goal of each rotation strategy is to systematically identify and provide exposure to leading strategy components on an ongoing basis. Images for illustrative purposes only. Portfolio allocations will vary. The Arrow DWA Balanced Fund may not be suitable for all investors. The fund may invest in commodity-related securities, which may be subject to greater volatility than investments in traditional securities. The fund may invest in international and emerging market securities, which may be subject to special risks including fluctuations in currency, government regulation, differences in accounting standards and liquidity. Investing in small-cap securities may have special risks, including wider variations in earnings and business prospects than larger, more stablished companies. The fund may invest in real estate-related securities, which may be subject to mortgage-related risks and real estate market fluctuations. The fund may invest in fixed income securities, which are subject to risks including interest rate, credit and inflation. The maximum sales charge for Class A is 5.75%. Class A investors may be eligible for a reduction in sales charges. The Fund charges a fee of 1.00% on redemptions of shares held less than 30 days.